Capital of the districts of Swabia and Neuburg, Bavaria. According to tradition, it is one of the oldest Jewish communities in Germany. The first documentary mention of the city is in 1259; but individual Jews of Augsburg are spoken of earlier. Of the six houses belonging to the church-chapter, and mortgaged in 1259 by Bishop Hartmann of Augsburg, one is described as "a Jewish house." Seal of the Jews of Augsburg, 1298. (From "Literaturblatt des Orients. ")Affluence of Jews. In 1276 the congregation possessed a synagogue and a cemetery. The chief occupation of the Jews of Augsburg was money-lending; trade in meat and wine was also permitted with certain limitations. In 1316 the Jews of Augsburg must have been affluent, for the city of Munich mortgaged its revenues to them for six years. Thirteen years later the Jews (that is, the revenues from them) were pledged by the emperor to the counts of Oettingen, and by the latter to the family of Hoheneck. In 1364 the council of Augsburg acquired possession of them. The city owed large sums to the Jews, and to liquidate them instituted, in 1341, forced loans from the citizens. The bishop's debts to the Jews were canceled in part by Charles IV. When the Black Death raged in 1348, and the Jews in Augsburg were massacred, the emperor pardoned the burghers for the crime. In 1349 the bishop again received Jews into the city, but six years later transferred to the city council both the duty of protecting them and the privilege of taxing them. The emperor demanded 10,000 gulden (1 gulden = 41½ cents) from the Jews of Augsburg in 1373; and the council vainly sought to protect them from this amercement. In 1384 they had to pay to the council 22,000 gulden; and in 1385 King Wenzel canceled all debts owing to the Jews. King Sigismund, in 1429, pledged them to Count von Pappenheim, to whom they had to pay 200 gulden yearly. The council bought back this right from Pappenheim in 1439. A year later 300 Jews were expelled from the city, and the gravestones in their cemetery were used in the construction of a city hall. In 1456 Frederick III. demanded that the city deliver to him "all his privileges"; he was appeased by the payment of 13,000 gulden, for which the city retained the right to admit or to expel Jews. From that time no Jews were permitted to dwell in Augsburg. In 1540 the council decided that Jews might stay no longer than a day and a night in the town; and they had to pay the officer who accompanied them during their stay one "sechser" for the service. In 1601 it was forbidden to borrow money of Jews. During the Thirty Years' war some Jews came to Augsburg. These were officially plundered from time to time under threat of being expelled; in 1649 they were again driven out; and in 1680 the former edicts of expulsion were revived and intensified. While the War of the Spanish Succession raged, a few Jews again ventured into the city; and in 1704 there were 62 families resident there. In 1718 even their temporary sojourn was again forbidden. From 1741 to 1745, Jews were again permitted to dwell in Augsburg on account of the War of the Austrian Succession. In 1742 they were 36 families; but they were driven out again in 1745. The council made an agreement with the Jews of the surrounding villages in 1751 to the effect that for the yearly payment of 1,100 gulden they might have free admission to the city for trading-purposes. 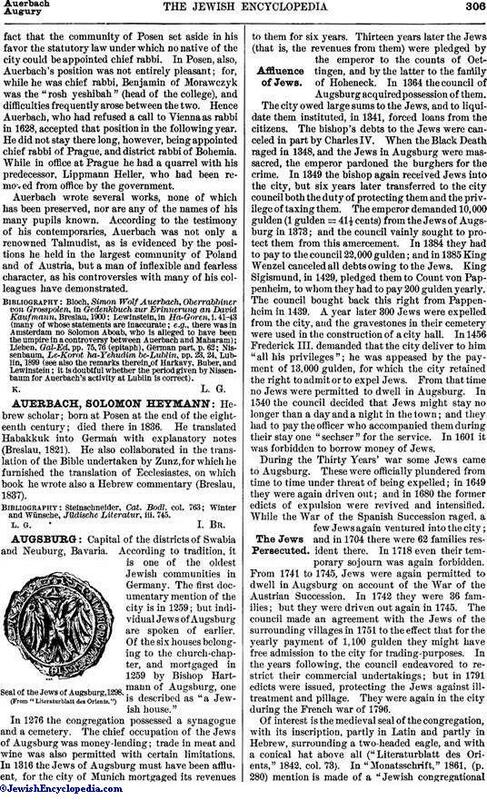 In the years following, the council endeavored to restrict their commercial undertakings; but in 1791 edicts were issued, protecting the Jews against ill-treatment and pillage. They were again in the city during the French war of 1796. Of interest is the medieval seal of the congregation, with its inscription, partly in Latin and partly in Hebrew, surrounding a two-headed eagle, and with a conical hat above all ("Literaturblatt des Orients," 1842, col. 73). In "Monatsschrift," 1861, (p. 280) mention is made of a "Jewish congregationaldance-house" in Augsburg (1290). Numerous Hebrew books, distinguished for their beautiful typography, were-printed there between the years 1514 and 1543. Of the various rabbis of the congregation of Augsburg mention must be made of the venerable Senior, who in 1348, an eighty-four-year-old sage, was assassinated while poring over his books. Elijah of Augsburg wrote a commentary upon Moses of Coucy's "Sefer Miẓwot Gadol" (Semag), which exists in manuscript in the Vatican library; Jacob Weil, son of Judah, one of the most distinguished rabbis in Germany in the fifteenth century, was also of Augsburg. The cemetery adjacent to the town served as the burial-place for five communities of Swabia. The new congregation has been in existence since 1861. In 1862 Dr. Hirschfeld was appointed rabbi; and he was succeeded by Heinrich Gross. The congregation now (1900) numbers 1,156 members. 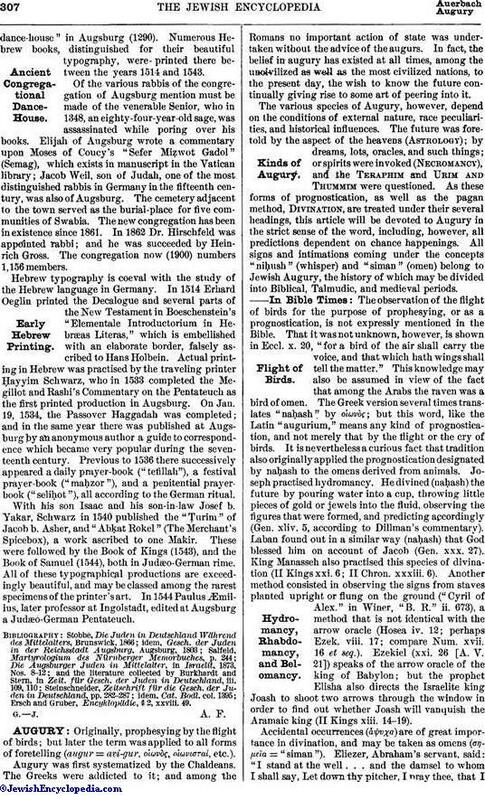 Hebrew typography is coeval with the study of the Hebrew language in Germany. In 1514 Erhard Oeglin printed the Decalogue and several parts of the New Testament in Boeschenstein's "Elementale Introductorium in Hebræas Literas," which is embellished with an elaborate border, falsely ascribed to Hans Holbein. Actual printing in Hebrew was practised by the traveling printer Ḥayyim Schwarz, who in 1533 completed the Megillot and Rashi's Commentary on the Pentateuch as the first printed production in Augsburg. On Jan. 19, 1534, the Passover Haggadah was completed; and in the same year there was published at Augsburg by an anonymous author a guide to correspondence which became very popular during the seventeenth century. Previous to 1536 there successively appeared a daily prayer-book ("tefillah"), a festival prayer-book ("maḥzor"), and a penitential prayerbook ("seliḥot"), all according to the German ritual. With his son Isaac and his son-in-law Josef b. Yakar, Schwarz in 1540 published the "Ṭurim" of Jacob b. Asher, and "Abḳat Rokel" (The Merchant's Spicebox), a work ascribed to one Makir. These were followed by the Book of Kings (1543), and the Book of Samuel (1544), both in Judæo-German rime. All of these typographical productions are exceedingly beautiful, and may be classed among the rarest specimens of the printer's art. In 1544 Paulus Æmilius, later professor at Ingolstadt, edited at Augsburg a Judæo-German Pentateuch. Ersch and Gruber, Encyklopädie, § 2, xxviii. 49.